"Riverdale" is back on The CW, Wednesdays at 8 p.m. The Season 3 premiere welcomes us back to "Riverdale" and what appears to be the hottest courtroom in all of America. 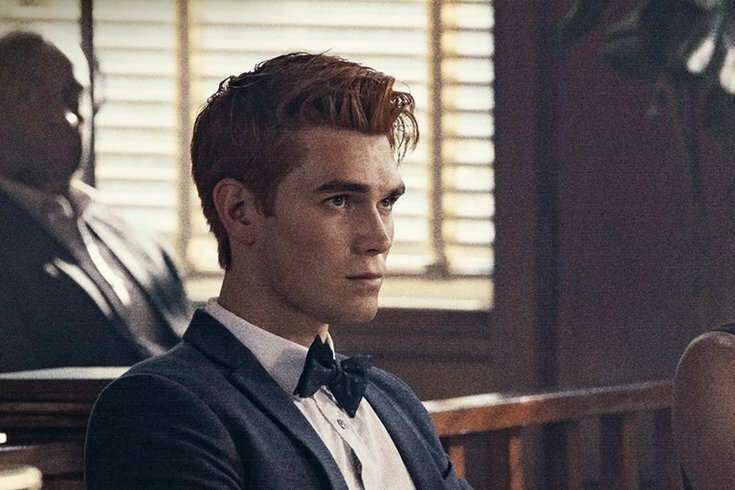 It's sweaty, hot, everyone is holding a fan, and ... oh, yeah, Archie is on trial for murdering Cassidy Bullock. His mother, played by Molly Ringwald, stands by his side as counsel, delivering a strong rebuttal to the D.A. 's closing statement. The court grants Archie the weekend to spend time with his family as the jury discusses the verdict. We then see the gang hanging out at Pop's with their famous milkshakes talking about finding a way to prove his innocence. At the behest of Betty and Veronica, Archie declares that he doesn't want to spend what could be his last days of freedom trying to find evidence of his innocence. Instead we enter into a weekend of partying, shirtlessness, crazy, weird cult members, and some very odd ritualistic, magical happenings. We begin to see a divide in family dynamics. Veronica begs her father to do something about Archie. She knows he's framing him, but Hiram, of course, denies everything claiming there's nothing he can do. Betty is having a weird time at home. Both her mother and sister are involved with "The Farm" and some guy named Edgar. Trying to convince her to go to "The Farm," Betty gives them a resounding no. Also, did we mention FP Jones gave Archie an honorary Serpent tattoo to give him some gang protection when he enters prison? Though, what kind of ink did he use? Will Archie ever be able to get an MRI after this? Betty and Cheryl go with Jughead to take back Hot Dog from the Ghoulies but are met with arguably the worst person in Riverdale, Penny Peabody, and her gang of Ghoulies. Penny goes as far to ask for Jughead's jacket. Ghoulies have the Southside, so they're not technically Southside Serpents anymore. (To each their own, Penny, to each their own.) Before it can go any further Cheryl pulls out her bow and arrow and saves the day. Though it does end with Penny declaring war on the Northside, so ... Yay? The show ends back in court, and the jury is tied 6-6 on their verdict. The judge declares a mistrial, and the D.A. gives a recommendation for time served with two years in a detention center. Archie yells out that he will take it. Now, we all know he's being framed, and we get that Archie is the good guy and he feels some remorse for working for Hiram – but Arch, bro, don't do it. The show ends with Archie being taken to a detention center as some really spooky things begin to take shape. First, Hiram admits he framed Archie to punish Victoria. Second, Jughead finds a map with some weird drawings all over it. He then follows the map to Fox Forest and finds a strange altar with a horned animal skull totem-thing. There are candles and bones in a near pentagram shape on the ground. Dilton Doiley and Ben are face down at the foot of the altar, and Jughead moves Dilton to see him foaming (green foam, nonetheless) at the mouth. The last shot we see is Betty arriving home to see whatever cult her family has become a part of doing some sort of fire ritual in their backyard. It looks as though they are about to throw Polly's twins into the fire until, that is, they start floating above the fire. Betty starts convulsing ... is she possessed? Having a seizure? Guess we'll find out next week.